About 50 small seabird chicks from the Chatham Islands have been translocated by a volunteer conservation group to predator-free Mana Island, off the Porirua coast. It is the first stage of an ambitious three-year project by Friends of Mana Island to bring back white-faced storm petrels to the island, which is managed by the Department of Conservation (DOC). A successful first year will mean a further 200 chicks will be translocated over the next two summers, with a total of 250. 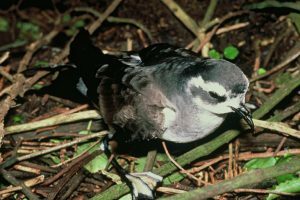 Friends of Mana Island president John McKoy says white-faced storm petrels used to live on Mana Island before any people inhabited the island. A few have been sighted there over recent years. “This translocation is part of the ongoing restoration of Mana’s original ecosystem based on a plan developed by DOC in 1999. “Our aim is to establish a colony of white-faced storm petrels on Mana Island to help restore the cycle of nutrients from sea to land, and improve the habitat for other animals and plants,” he says. For the next three weeks volunteers will hand feed the chicks sardine smoothies and monitor their growth. Each chick is housed in an artificial burrow high on the clifftops of Mana Island. The burrow entrance is gated until the chick is ready to come outside and eventually fly away. The chicks were carefully selected by wildlife biologist Cathy Mitchell, volunteers and DOC staff, from the source island – Rangatira Island in the Chathams, also known as Hokorereora or South East Island. The island has more than a million breeding pairs of white-faced storm petrels. Each chick chosen is estimated to be 6-7 weeks old and a minimum of 45 grams, the optimum size and age for survival and success. The journey to reach their new home on Mana Island has involved many forms of transport – a fishing boat from their island colony to the main Chatham Island, a plane to Wellington, a van across the airport, and a helicopter ride to Mana Island. Representatives from Hokotehi Moriori and Ngati Mutunga travelled with the birds every step of the way from the Chathams, and formally handed them over to Mana Island local iwi Ngati Toa. The chicks are expected to fledge within the next 7-15 days and fly out to sea. They will stay at sea for three to four years before looking for a place to breed. Seabird expert Graeme Taylor from DOC says it is hoped some of the birds will return to Mana Island to breed and start a new colony. He says similar transfers of other burrowing seabird chicks have had return rates to the new colony site of 10 to 40 percent. “Some birds will naturally choose other breeding colonies, although there are none nearby in the Cook Strait region. “To have a good chance of establishing a new colony on Mana Island we need a critical mass of at least 10 breeding pairs,” he says. 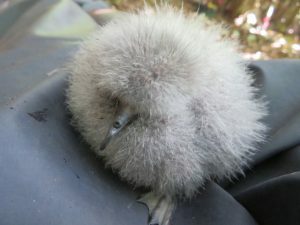 The project is funded and supported by Friends of Mana Island’s major sponsor OMV New Zealand Ltd.
White-faced storm petrel chick, 6-7 weeks old. Photo: Cathy Mitchell. 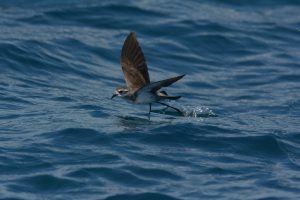 White-faced storm petrel, ‘walking on water’. Photo: Christopher Stephens. White-faced storm petrel adult bird. Photo: DOC.